The Woodcote is a 4-bedroom home that features an open-plan kitchen and dining area, separate living room, en suite to the master bedroom and a contemporary family bathroom. On the ground floor, the fitted kitchen comes complete with a stainless steel oven, gas hob and chimney hood. 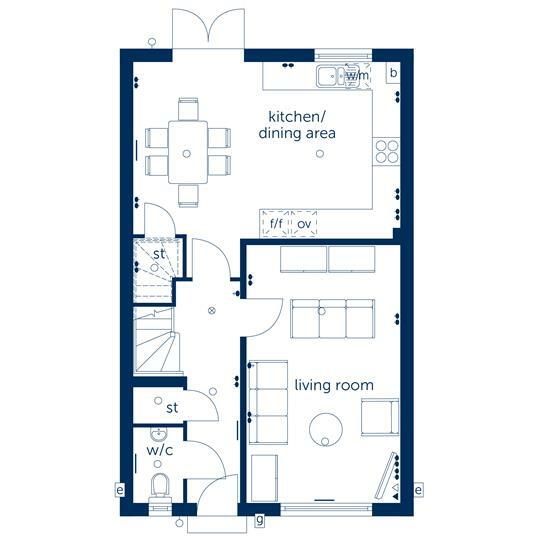 Space is also included in the layout for a fridge freezer, washing machine and dishwasher. Double doors in the dining area give access to the rear garden. The living room is situated towards the front of the property and affords views of the turfed garden. A cloakroom and hall storage cupboard complete this level. 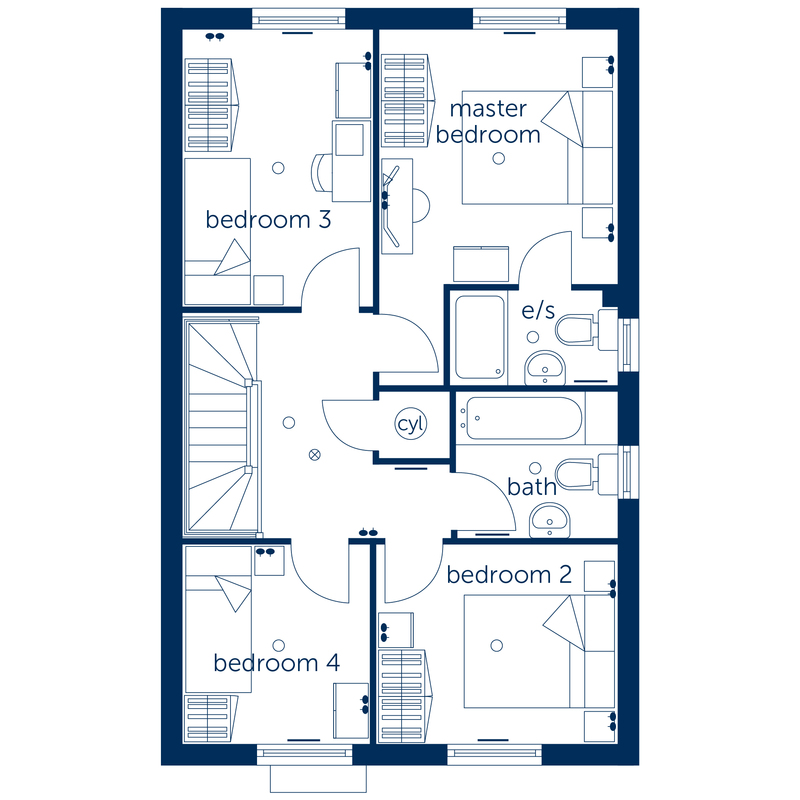 On the first floor, the master bedroom benefits from an en suite with shower enclosure, while the remaining bedrooms share the family bathroom. Both bathrooms are equipped with Roca white sanitaryware, Bristan chrome-finish brassware and ceramic tiling. 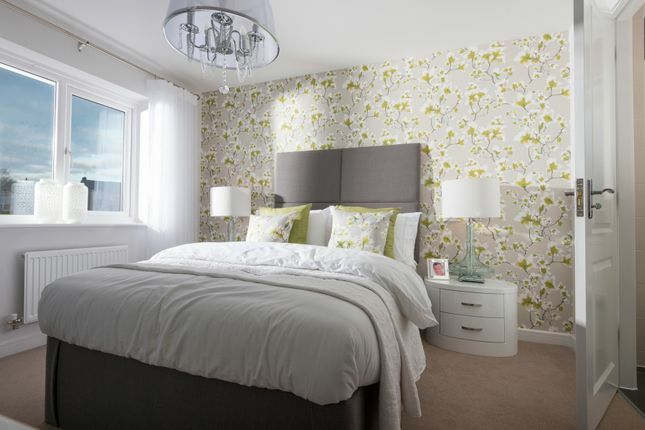 St Lythans Park is a development of 2,3,4 and 5-bedroom new homes in Wenvoe, on the outskirts of Cardiff. Ideally located for access to the M4, the development is suited to a range of audiences, including professionals commuting into the city and further afield, investors and families. All properties are finished to a high specification, with quality fixtures and fittings throughout, and all benefit from off-street parking. For families, these new homes in Wenvoe are located near a number of well-regarded schools, including Wenvoe ciw Primary and St Fagans ciw Primary, which are both around one mile from the development. Secondary schools for older children include Barry Comprehensive (boys only, co-educational sixth form) and Bryn Hafren Comprehensive (girls only, co-educational sixth form). Residents will find a variety of local amenities within 20 minutes walk of St Lythans Park in Wenvoe village, comprising a convenience store and post office, pubs, library and village halls. Three retail parks – Brooklands, Wenvoe and Valegate – lie around a mile from the development, while the charming market town of Cowbridge, home to a number of independent boutiques, is around nine miles away. For big brand names, department stores and a wealth of cafés and restaurants, Cardiff city centre can be reached in less than 20 minutes by car. St Lythans Park is surrounded by woodland, fields and farmland offering a multitude of opportunities for outdoor activities, including cycling, walking and horse riding. Wenvoe Castle Golf Club, around two miles from the development, is said to be one of the finest courses in Wales and welcomes players of all abilities, while the local pétanque club is thought to be the oldest in the country. The village is also home to a community nature reserve, a play area for children and sports pitches. Slightly further afield, the National Trust’s Dyffryn Gardens feature formal lawns, an arboretum, glasshouse and outdoor garden rooms of Edwardian design, while the beaches of Barry Island are around seven miles away. For commuters, the development is conveniently located for access to the M4, connecting the area to Port Talbot and Swansea in the west, and London (via Cardiff, Bristol, Reading and Slough) in the east. The nearest train station is Waun-gron Park in Fairwater, three miles away and from there trains run into Cardiff Central. Services from Cardiff Central call at a number of towns and cities, including Manchester, Bristol, Bath, Gloucester, Southampton, Birmingham and London. For domestic and international flights, Cardiff Airport is less than seven miles from the development via the A4050. Contact our sales team for further information about these new homes in Wenvoe. Property descriptions and related information displayed on this page, with the exclusion of Running Costs data, are marketing materials provided by Bellway - St Lythans Park, and do not constitute property particulars. Please contact Bellway - St Lythans Park for full details and further information. The Running Costs data displayed on this page are provided by SmartNewHomes to give an indication of potential running costs based on various data sources. SmartNewHomes does not warrant or accept any responsibility for the accuracy or completeness of the property descriptions, related information or Running Costs data provided here.